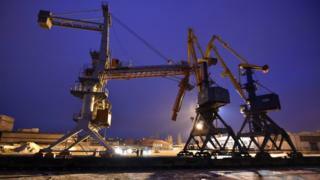 The port of Mariupol in eastern Ukraine has become a symbol in recent months of the country's economic struggles. A recent partial blockade by Russian naval vessels of the nearby Kerch Strait means that fewer ships are now docking at the harbour. The port has lost 33% of its fleet and up to 140,000 tonnes of exported metal products a month since Russia's construction of a bridge across the Kerch Strait in May 2018, and restrictions on the size of ships that can pass underneath. Hundreds of jobs depend on the work here - Mariupol is Ukraine's second port - and many tens of thousands more depend on the export of goods it allows. "Big business feels it and we all feel it too because prices are rising," says Galina Balobanova, a local businesswoman. "A lot of people work in the port and they're not being laid off, but for them it's an unexpected vacation. We need this trade and for the blockade to be lifted." Yet it's not just the relationship with Russia that is the problem for firms in Mariupol. Another businessman, who doesn't want to be named, meets me in a local bar and puts it bluntly: "The Russians are a big problem - but the corruption here is the single biggest thing strangling our trade." Money for much-needed dredging of the harbour has simply gone missing, he tells me, presumed stolen by officials, and this has placed big limits on the types of ships reaching the dock. The way that corruption impedes business in Ukraine is varied and has been widely studied. In the past ordinary citizens would often have to pay a bribe just for simple procedures such as a visit to a doctor, obtaining a passport or driving licence. Much of this has now improved, though, thanks to a system called PreZorro that bypasses human officials and allows digital processing of applications and tenders. "The last five years the pace of reforms is amazing," says Olesia Verchenko, academic director at the Kyiv School of Economics. "If you look at the price of drugs, for example, in hospitals you sometimes have a tenfold decrease in the health ministry's costs [as a result of the reforms]." These changes mean that regular small and medium-sized businesses in Ukraine may not see corruption firsthand. But experts say it is still a problem at the highest level, in the courts and among the political class. "They stole money from our army, they stole the lives of our soldiers," says Vyacheslav, a protester I meet at a noisy demonstration in Independence Square in Kiev. The charges he refers to are recently revealed documents implicating senior members of Petro Poroshenko's government in a defence procurement scam worth some $10m (£8m). Smuggled Russian munitions and other weaponry were allegedly sold to the Ukrainian military at wildly inflated prices. The two senior officials have been suspended by the president pending an investigation. "They were so confident they wouldn't get caught, they filtered the money through their own companies," says Sergey Leshchenko, an MP and former investigative journalist. President Poroshenko has not been directly accused of any wrongdoing himself. But one of those firms was one formally owned by the president. "It's impossible he couldn't have known," Mr Leshchenko adds. The IMF has made accountability and transparency a condition of recent bailouts in Ukraine, but even it admits that those accused of corrupt practices are rarely seriously punished. In what's been seen as a backwards step, just two days after the defence scandal broke, the constitutional court ruled that those accused of corruption no longer have to provide evidence in court on how they came by their wealth. For Mr Leshchenko this scandal has been the last straw. He has withdrawn his support for President Poroshenko and is not backing any of the other established parliamentary candidates in this month's presidential election either, saying the entire political elite is compromised. "Fixing corruption in this country is Ukraine's number one problem, it has to be stopped," he says. "It's in the interests of Europe and the whole world and that's why I urge friends abroad not to back Ukraine's corrupt leadership but to protect anti-corruption institutions - and free and fair elections."